Food Costs > How Much Do Onions Cost? How Much Do Onions Cost? Onions, just like garlic, are members of the Allium family, and both of these are high in sulfur-containing compounds, which are responsible for their odors. Onions are high in vitamin C, fiber and each serving has less than 50 calories. Onions commonly sold at the grocery store or farmers market will by the pound or by the bunch. No matter how they are packaged, the price varies according to what kind of onion you are buying and where you live. Common types of onions, as described inside the table below, can include the red onions, scallions, Vidalia, brown, and yellow onions. Red onions are known to cost more than the white and brown, but, they also provide a unique flavor when compared to other varieties. Overall, onions, regardless of the type of onion you purchase, you plan on spending $1 to $3 per pound. Refer to our table below to see what each type of onion can cost. Scallions or green onions are commonly sold by the pound or by the bunch, and the average cost of a bunch can be around $0.50 to $1. Some stores sell onions by the pound, and the price, if sold this way, can run anywhere from $2 to $3 per pound, making the average bunch cost $1.50 to $2. The same price range can be applied to yellow onions. They also cost around $1 to $2 per pound. However, there are times when their price goes higher, especially if the crop outlook isn’t as good as prior years. 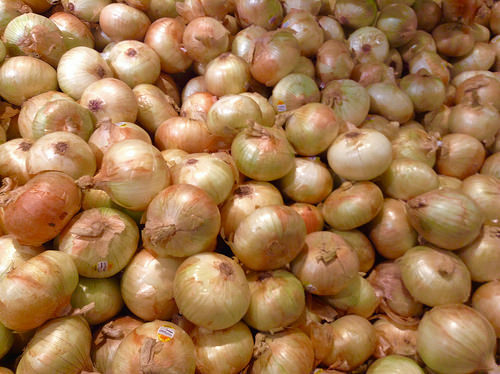 Vidalia onions, on the other hand, can cost $2 to $5 per bag, with each bag containing up to 10 onions. FoodCoop.com, for example, lists the average price for onions around the United States. At the time of this writing, an organic Vidalia would cost about $1.25 per pound in Georgia, while a three-pound bag would retail for $1.50 each in Canada. A loose yellow, with no label, would cost close to $1.50 per pound, whereas an organic mini purplette onion would cost $3.25 each. The USDA, as of this 2013 report, says the average fresh pound of onions will cost $1.04 per pound. Not all states in the country can grow onions. Because of that, the production of onions in restricted to a certain place, making it a lot expensive for other regions that do not have onion production. Vidalia onions, for example, could not be grown in the state of Iowa. Because of this, since they must be transported, the cost can be higher. Like most vegetables and fruits, growing onions will seasonal in most parts of the country. If it is considered to be the offseason, then you will likely pay more per pound. Some onions are grown naturally and preservatives are used to keep them fresh, while other onions may be organic, meaning that they are all-natural and contain no preservatives. Finally, there are onions that are produced in an artificial setting. The way the onion was produced is going to greatly affect the price. Organic onions are going to cost the most. Onions can be added to almost any dish to enhance the flavor, but this is not their only use. They can also be used to repel insects, for example. They also have a variety of medicinal effects. Since they are rich in vitamin C, they can be used to treat colds, coughs and asthma. These effects can be felt by inhaling the onion vapors. Onions are also a good source of fiber and other key nutrients. When purchasing onions, you should look for a dry outer skin free of spots or blemishes. The onion should be heavy for its size and have no scent, according to the National Onion Association of USA. As per Onions-usa.org, dry bulb onions must be stored in a cool, dry, and well-ventilated place. They should not be stored in plastic bags as the lack of air movement will shorten the storage life of bulb onions. Aside from shopping around for cheap onions, you can save money if you have the time and means to plant and grow your own onions in your vegetable garden. It’s almost always cheaper to purchase onions in larger bags. Almost all grocery stores and wholesale clubs offer bulk bags for as little as $3 to $5 for a 10-pound bag. Local farmers markets are often cheaper than your local grocery store.